Irvine Quik & the Search for the Fish of Traglea (Duncan Bowsman; 30-Sep-2012; ADRIFT 4). IF Comp 2012: 18th place of 28 entries. Irvine Quik & the Search for the Fish of Traglea - at IFDB. 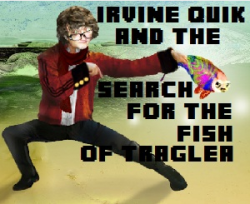 Irvine Quik & the Search for the Fish of Traglea - at ifwizz interactive fiction (in German). Download IQSFoT_walkthrough_document.pdf from the IF Archive. Walkthrough in PDF format by the author. This page was last modified on 26 March 2019, at 05:34.